Celebrating our 3rd anniversary by taking you on a food tour of Cadiz! Celebrating our 3rd anniversary by taking you on a food tour of Cadiz! Home » BLOG » Celebrating our 3rd anniversary by taking you on a food tour of Cadiz! Celebrating our 3rd anniversary by taking you on a food tour of Cadiz! Hi! Welcome to the 3rd anniversary celebration of Genuine Andalusia! Thank you for coming! We hope you’re hungry because we’ve prepared a surprise for you! A special party where food and food bloggers from the province of Cadiz will be the stars! Get ready because we are taking you on a food tour of the province where Genuine Andalusia was born! We love our food and what we enjoy the most is to share it with other food lovers! If you are reading this, you surely also do, right?. Great! So join us in this gastronomic adventure! During this food tour, you will be able to meet 5 passionate local food bloggers from Cadiz, who have prepared 4 fabulous dishes, that are representative of our local gastronomy. They will also tell us their stories and they will share their insider recommendations for a perfect food tour of the province of Cadiz! Ready? Let’s start by meeting our friend Ralu, who has brought an amazing starter! Ralu: I have been interested in gastronomy and I have enjoyed eating good food for as long as I can remember. However, it was when I moved out from my parents’ when I really started to cook. What mostly called my attention then was to give a certain orientation to the dishes I cooked. I wanted to give them my personal twist and to make them more attractive, but following traditional recipes. The idea of launching my blog was born from a conversation I had with my friend Javi Recetas, who has one of the most visited food blogs written in Spanish. He helped me and encouraged me to start sharing my recipes and also information about my favorite places to eat. G.A: How do you think the province of Cádiz has influenced this passion? Ralu: I think the influence is huge. “I feel so lucky to have such a wide variety of quality ingredients sourced locally: wine, fish, meats, vegetables, cheeses… The province of Cádiz has the coast, the mountains, the country, the estuaries… It’s impossible not to fall in love with it and with its gastronomy”. Ralu: It’s been a hard decision because the gastronomy of Cadiz is very diverse but I thought I’d bring adobo. Both the way it’s presented and eaten, in small one-bite portions, make it a great starter and the perfect finger food for this type of celebrations. 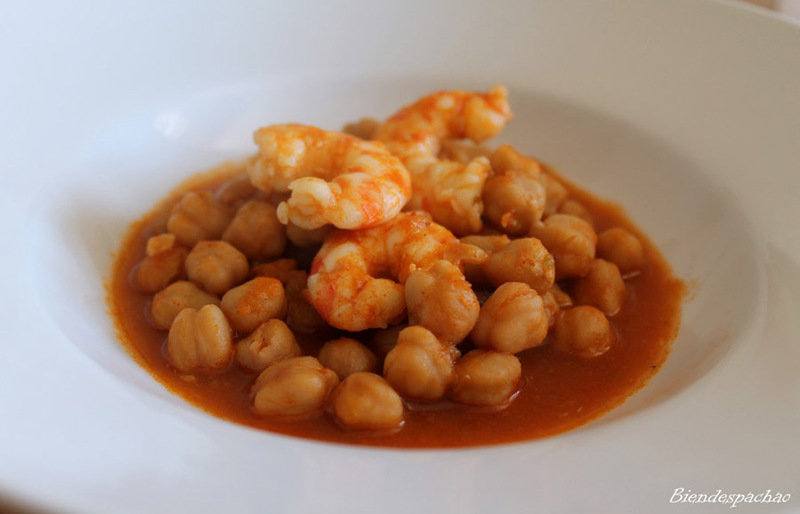 It’s a very typical recipe all along the bay of Cádiz, it’s very easy to cook and usually everybody likes it. Normally people use dogfish but I have used red tuna instead. You have the recipe here. You can also use blue fish such as mackerel or anchovies. G.A: Which local wine should we pair this delicacy with? Ralu: My recommendation would be a Manzanilla from bodega Portales Pérez – Los Caireles in Sanlúcar. It’s a fresh, delicate and salty manzanilla. A fino sherry or a white wine from Cádiz would also be ideal. G.A: Now tell us, which bar, tavern, restaurant or venta of the province of Cadiz should somebody go to if they want to eat great food in a local and authentic environment? Ralu: This is not difficult in the province of Cádiz! My recommendation would be Cantina del Titi El Bartolo on La Casería Beach in San Fernando. They’ve got great fish and lovely views of the bay of Cádiz. “You can eat your food with your feet buried in the sand while you watch a magical sunset”. We hope that Ralu’s red tuna in adobo opened your appetite. 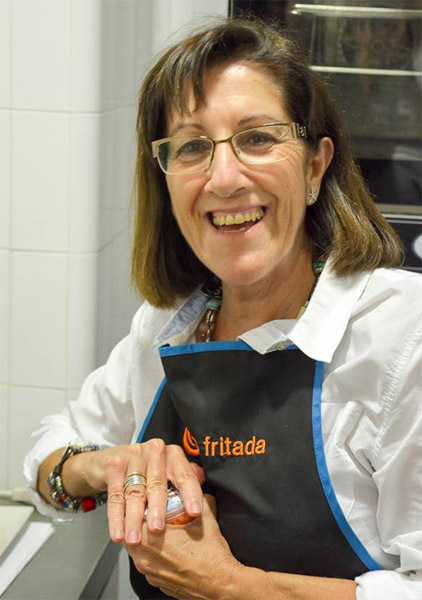 Now let’s continue our food tour by meeting Lola López, another food blogger from Cádiz who is just there preparing probably the most renowned local dish from the coast of Cádiz. Curious? Genuine Andalusia: Hello Lola! What are you cooking? How did you choose this particular dish to bring to the party? Lola: I knew I wanted to cook something with fish or seafood because they have always been very present in my family. My father and my uncles had salt industries and since I was little I have seen how the fish in the adjacent estuaries was caught. “I believe that the fish and seafood growing in these natural estuaries has a taste like no other”. 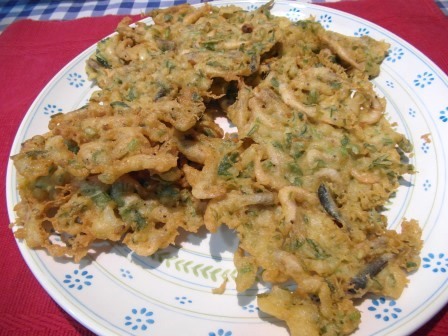 There’re many local fish and seafood dishes that can be cooked with them but I’ve chosen tortillitas de camarones (baby shrimp fritters). You can check the recipe here. G.A: What area in the province of Cádiz comes to your mind when you eat these? Lola: Puerto Real, no doubt. I’m from this town and it’s there where the salt industries I knew when I was little are. Moreover, I still go to buy my fish and seafood there. G.A: And which wine do you like to accompany them with? Lola: I very much like the white wine from Bodegas Forlong in El Puerto de Santa María. G.A: When did you start cooking and how did you come up with the idea of having your own food blog? Lola: I started cooking when I was little. I have some small notebooks with handwritten recipes and small illustrations that I still keep from that time. I very much enjoyed being with my mom in the kitchen, watching her cook, helping her and asking her questions about the food she prepared. Years later, I began to write about food in a newspaper and after that I launched my own blog La Fritada in 2012. G.A: Which place amongst your favorite would you recommend to someone taking a food tour of the province of Cádiz and wishing to immerse themselves in the local gastronomy? Lola: Only one? It’s difficult! Ok, let me choose. “I’d recommend Venta Melchor in El Colorao because hey have excellent traditional food, cooked with quality local ingredients”. We hope you enjoyed the starters. Our food tour continues now with the first main course. In Spain we like to eat two main courses and the first one has been brought to our party by two foodie sisters from Cádiz: María Luisa and Carmen Ibáñez. They have a great food blog called “Biendespachao”. “Biendespachao” is what they tell you in the stalls of local markets in South-West Spain when they give you a little extra of what you ordered for free. There they are! María Luisa and Carmen Ibañez. G.A: Hello María Luisa and Carmen. What have you brought to the party? María Luisa and Carmen: after these wonderful starters, we thought it’d be good to continue with a nice fish-stew. So we’ve brought one with chickpeas and king prawns! You can read the recipe here. G.A: Oh wow! Where did you learn to cook that? ML and C: We’ve always liked to cook. “We have learnt all we know from our grandmother and our parents at home. Our blog pays homage to them, to their recipes, to their teachings and of course, to the diverse gastronomy of the city of Cádiz and of the whole province”. G.A: What would you recommend to drink your stew with? ML and C: With a glass of oloroso sherry. The oxidative and wood notes of this type of sherry go well with chickpeas, which are a dry legume. G.A: What’s the best part of cooking in the province of Cádiz? ML and C: the vast variety of quality local produce which invites you to experiment with it, to create new recipes or to remember and improve the traditional ones. We should be proud of that and that’s why our recipes always have a Cadiz twist. G.A: Where would you recommend to start a food tour of Cádiz old town?. ML and C: In el chicuco in Plaza de San Juan de Dios. It has a very nice atmosphere that reminds us of an old food shop. It has a great selection of local wines, cheeses, cured meats and salt-preserved foods. Thanks María Luisa and Carmen! Now get ready for the second main course of our food tour! Pilar and Cristina, mother and daughter from Rota and renowned food blogger and chef respectively have baked a whole corvina fish Rota style! (Recipe here). 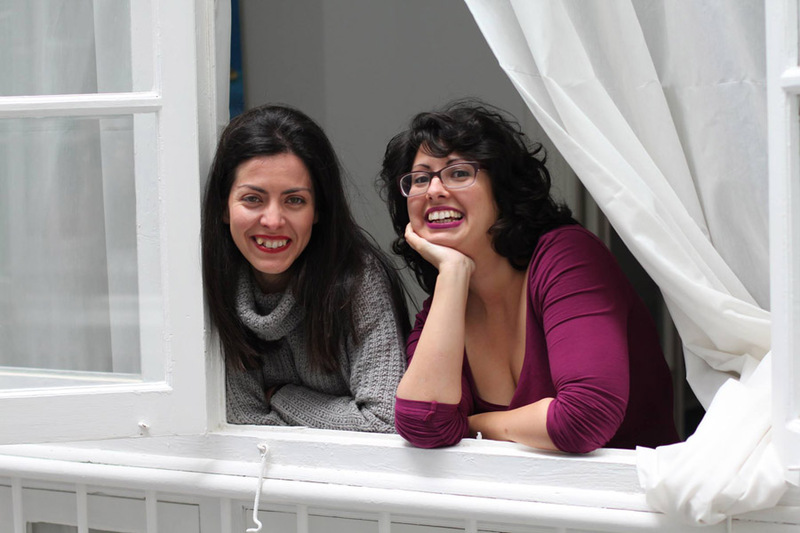 Pilar and Cristina, food blogger and chef from Rota, province of Cádiz. G.A: This looks wonderful Pilar and Cristina! 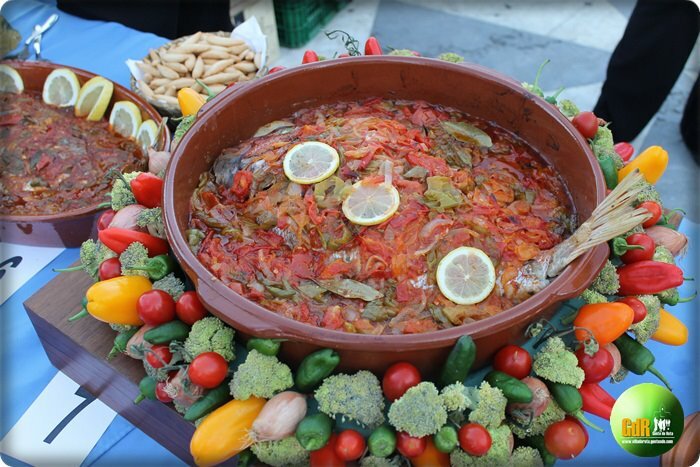 Could you tell us about Rota and its gastronomy and how the recipe of fish cooked Rota style was born? 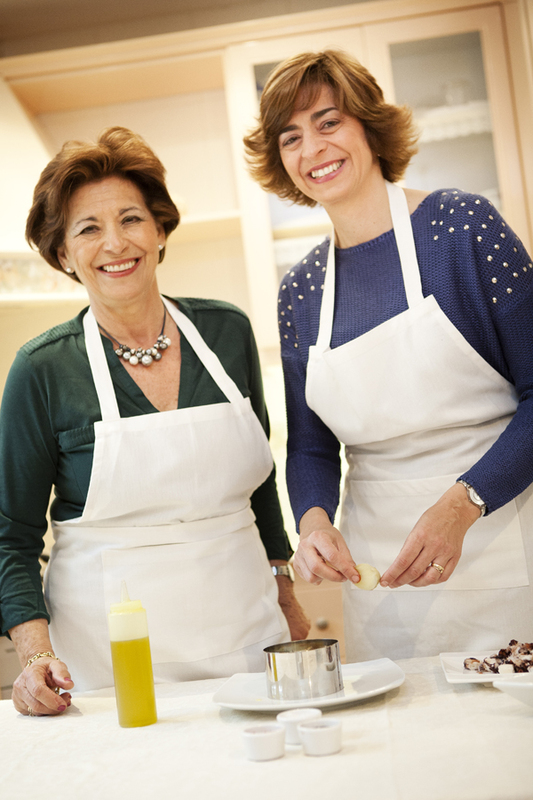 Pilar and Cristina: in the old times, Rota made a living out of fishing and agriculture and, as a result, this recipe combining fresh local fish and vegetables became popular. “The most usual fish to cook Rota style is Urta (red-banded sea bream) but we have cooked many different fish Rota style (cod, red porgy, corvina like today…). It’s always delicious!”. G.A: What should we pair these wonders with? Pilar: With a glass of chilled en rama Fino Sherry. “En rama fino Sherry goes wonderful with fish and even more so when it’s cooked Rota style with vegetables such as tomatoes, peppers and onions. Furthermore, this fish is cooked adding fino sherry during the baking as well as brandy from Jerez”. G.A: Now tell us about the great food team you’ve formed together. Pilar: I have always liked cooking, but it was when my mother and I decided to start sharing her recipes and our family’s through our blog Aprendiendo a Cocinar, when it became our passion. 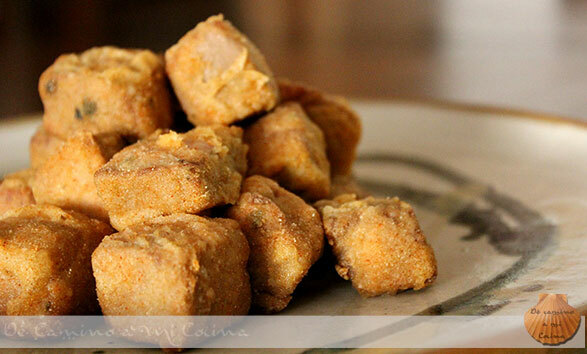 My mother has always been an excellent cook and it made me sad to think that her recipes were only written in my recipe book, so on the 12th of June 2013 I decided to share the first one online. Then came more and more… So far we’ve shared almost 700 recipes! G.A: Could you list the places of the province of Cádiz that are famous for their quality local ingredients? And then there’s our local wines… Our sherries and manzanillas from Jerez, El Puerto de Santa María and Sanlúcar are unique to this province. When we started we thought there’d be one day when we’d run out of recipes but with all this variety, now we don’t see the end of our gastronomy and blogging adventure! G.A: Which restaurant would you consider a must for a food tour of the province of Cadiz? Pilar: I personally love La Carboná restaurant in Jerez for many reasons. 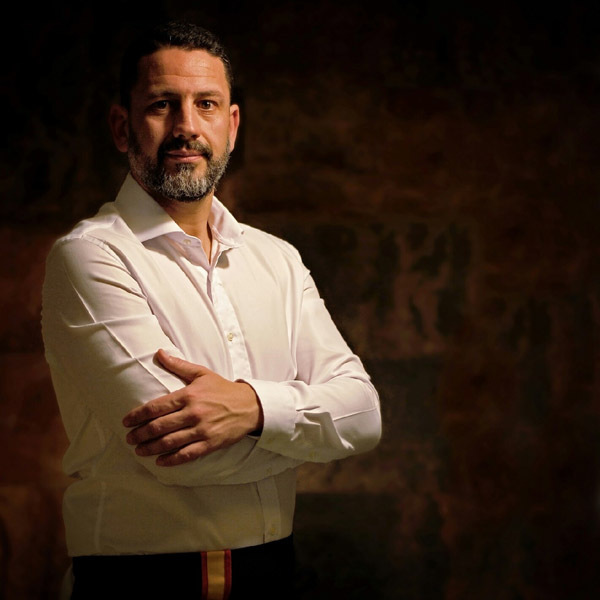 “It’s an old Sherry bodega that has been restored and they have amazing ingredients that they cook and pair with amazing sherries. They have a pairing menu that is simply fantastic. I believe it’s definitely a must in any food tour through the province of Cádiz”. Thank you Pilar and Cristina! We hope you enjoyed this foodie adventure through the province of Cádiz as much as we have enjoyed sharing it with you! If you’d like to have a tailor-made food tour through South West Spain, filled with authentic local experiences and passionate foodie hosts, don’t hesitate to contact us. We can take you and your party to cook to our foodie friends’ and to eat with them, to visit the most committed, friendly and fun wine makers and local producers, we can go for tapas to the most authentic tapas bars and we can top all this up with some country or urban walks to walk-off your food and with hand-picked hotels where to rest a happy soul and belly! Me encanta esta promoción de la cocina y los vinos de la provincia de Cádiz. Gracias Begoña, nos da mucha alegría que te haya gustado la iniciativa. Un abrazo desde Genuine Andalusia. Ole, thanks a lot for this great article and Récipe ideas. Greetings from Japan, G.A. Thank you for your comment! We hope you enjoyed the party and that you’ll cook the recipes our guests shared. We hope to see you soon in the province of Cádiz too!